The Easter School holidays are about to start. But what is Easter all about? We know it’s more than just chocolate and bunnies, but why do Christians consider Easter far more important than Christmas? Why not join us at Messy Church this coming Saturday to help us think about the Easter message through our usual mix of fun, faith and food. They’ll be plenty of craft activities to help us explore the Easter story and we’d love you to stay and eat with us – fish fingers this week! We hope to see you at St Catherine’s this Saturday (April 6th) at 3:30pm. The April issue of RG31 – our Parish Magazine – is now available on-line here, or click on the image. The review of 2018 (Reports for 2019 APCM) is also available here, or click on the image. Friday Friends meets weekly from 2.00 – 4.00pm every Friday, price £3.50 (carers free), offering a mix of talks, light exercise, singing together, tabletop games or craft activities in a safe, warm and friendly environment – with tea and cakes. Here’s the programme for the rest of March through to May 2019. The March issue of RG31 – our Parish Magazine – is now available on-line here, or click on the image. Easter Eggs may have been in the shops for months, but we’re only just about to start Lent – the 40 days before Easter. What’s Lent about and why am I supposed to be giving something up? Come along to Messy Church on Saturday to find out! Why not bring a friend to explore our theme of “Giving Up?” through our usual mix of Fun, Faith and Food. We’d love to see you at St Catherine’s on Saturday from 3:30pm. There is a Jumble Sale in St Catherine’s Hall on Saturday 16th February opening at 2:00 pm. Entrance 25p. Refreshments and car parking are available. The February issue of RG31 – our Parish Magazine – is now available on-line here, or click on the image. It’s time for Messy Church this coming Saturday afternoon. As the shops fill with hearts and valentines, our theme this month is ‘Love God’. As usual, this is a great chance for the whole family to spend time together with Craft Activities, Stories, Songs and a Hot Meal to finish. So please join us at St Catherine’s on Saturday 2nd Feb at 3:30pm for Fun, Faith and Food. 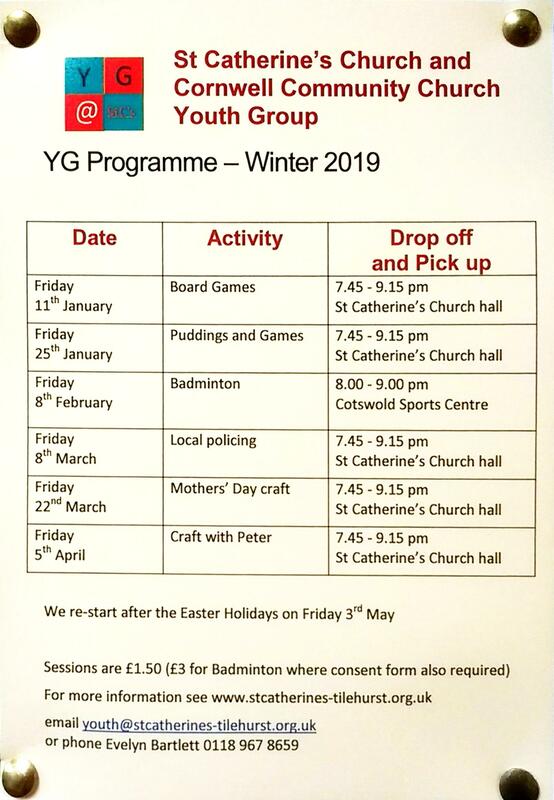 The Youth Group is for secondary school aged young adults and meets fortnightly in St Catherine’s Hall from 7:45 to 9:15pm. See the flyer for additional dates and details.